The only other soundtrack I have listened to in its entirety by JJ is ‘The Theory of Everything’; and regardless that I struggle with the format of music split into sections to play alongside film (as opposed to actual songs), this did intrigue me somewhat. ‘The Beast’ (that carries on into ‘The Border’) is an ominous display of dark pads and martial, pounding beats; much akin to a lot of the music I listen to if truth-be-told. I always pull a wry smile when some people pull a face at some of the Industrial in my collection, yet don’t seem to notice it when similar styles are used on commercial projects such as this. Of course, as with all soundtracks, I imagine this does follow the path, as it should do on the actual movie (I haven’t seen it yet). However, where I struggled on his last venture, here I genuinely lapped up every minute; which I can only surmise is because I happen to enjoy this style of music in general. From the gritty Dark Ambient and noise of ‘The Tunnel’, to the Neo-Classical pomp of ‘Drywall’ and ‘Balcony’, these are offset with momentary flutters of guitar ambient (‘Melancholia’); displaying a more serene tone to the array of black storm clouds that surround it. I am not one for proper soundtracks in general; I find them too stop/start as a format. 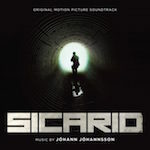 However, ‘Sicario OST’ is an excellent release as a whole and well worth your time and money. Maybe I should watch the actual film now and see how this all fits in.